Located in the north-western corner of South America, the republic of Ecuador borders Colombia to the north, and Peru to the east and south. Its territory includes the distant Galapagos Islands. 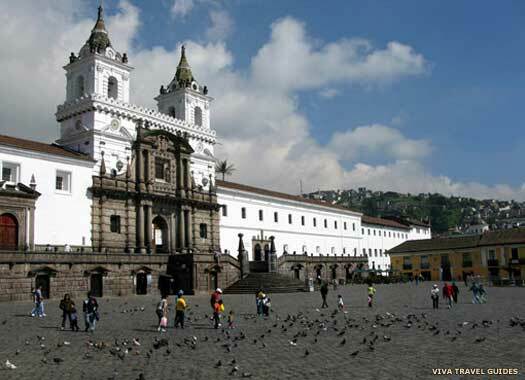 The country lies on either side of the equator and its name reflects this location, while its capital is Quito. Ecuador was initially part of the New Kingdom of Granada, which was administered from Peru until 1717. Then it became part of the newly created viceroyalty of New Granada, and then its successor, Gran Colombia. Internal dissention led to several civil wars between the various rivals for the leadership of Gran Colombia's territories, and the state broke up in 1830. Ecuador and Venezuela both left, and the dissolution of Gran Colombia was made official on 21 November 1831 when Ecuador, New Granada and Venezuela all formed new republican governments. The general, Juan Jose Flores, became Ecuador's first president. Arguing that treaties signed with Gran Colombia have been rendered void upon the dissolution of that federation, Peru fights another war over disputed territory bordering the Amazon, this time with Ecuador. Civil war erupts within the country, greatly hindering peace negotiations. Together with the Roman Catholic Church, Gabriel Garcia Moreno is slowly able to reunify the country. The president, Ignacio de Veintemilla, is overthrown in a popular revolution. The fate of the old administration is sealed when the exiled Jose Placido Caamano organises a revolutionary expedition which lands on Ecuadorian territory on 17 April. Guayaquil is besieged and falls in mid-May, and Caamano is elected president of the government of the restoration. The Herrera-Garcia Treaty is negotiated by the king of Spain between Peru and Ecuador over their ongoing border dispute. However, the terms are not considered favourable to Peru so the parliament attempts to introduce amendments, which Ecuador refuses, pulling out of negotiations. In December 1917, Ecuador declares for the allies in the First World War against Germany and the Austro-Hungarian empire, but takes no active role in the conflict. With the signing of the Treaty of Salomon-Lozano, Peru agrees the borders with Colombia by seceding all territory between the Putumayo and Caqueta rivers, to the detriment of both itself and Ecuador. The poor state of the economy combined with popular unrest sees President Gonzalo Cordova overthrown in a bloodless coup in July 1925. The First Provisional Government manages the country between 10 July 1925 to 6 January 1926. The Second Provisional Government is in charge between 10 January to 31 March 1926, after which elections are held and a new president is appointed in the form of Isidro Ayora. Peru signs an agreement with Ecuador which agrees that the territories they each control along the disputed border are recognised as de facto possessions, and the '1936 status quo border line' is confirmed. The Ecuadorian-Peruvian War is fought between 5 July 1941 and 31 July 1942 as a continuation of the 1859 war. The Rio Protocol brings peace until 1960. Ecuador officially joins the Second World War as an ally of the USA and Great Britain on 2 February 1945 against Japan and Germany, although it has defended the Galapagos Islands from the allies since 1943. Peru declares the 1942 Rio Protocol with Ecuador to be null and void, although little immediate impact is caused by the decision. A military junta overthrows President Carlos Julio Arosemena Monroy and itself governs Ecuador between 11 July 1963 and 29 March 1966. Admiral and leader of the military junta. The military junta is overthrown by General Telmo Vargas, chief of staff of the armed forces, who is subsequently elected president. His term lasts an entire eight months before he is removed from office and fresh elections are held. A military junta led by General Guillermo Rodriguez overthrows the government of President Velasco Ibarra. The president is exiled to Argentina and the general assumes command of the country. Military leader. Overthrown by a fresh military coup. Admiral and military chairman of the supreme council. The military junta paves the way for fresh elections and then Alfredo Poveda stands down on 10 August, returning Ecuador to its full status as a democratic republic. Peru and Ecuador clash briefly in the Paquisha War, little more than a border skirmish. Both sides increase their military presence as a result. The aftermath of the 1995 Cenepa War between Peru and Ecuador sees the long-running dispute reach a final conclusion. On 26 October 1998 both countries sign a definitive peace agreement.